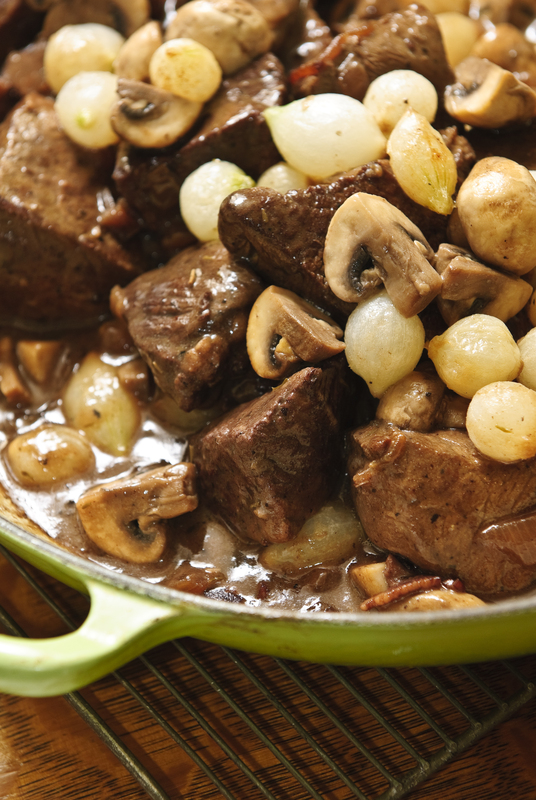 So, how is my version of Beef Burgundy (Boeuf Bourguignon) different from so many others out there? It’s all about choosing the right cut of meat. Read my recipe, then start planning a lovely dinner party. There are many great things about this menu, starting with the fact that the main dish can be made a day or two in advance, refrigerated, and reheated. Or you can simply make it a few hours in advance and let it sit at room temperature for up to 2 hours before rewarming it and serving it. PS: Have you seen my list of great Christmas gifts for the Food and France lover? Check it out! • Starter through Salad: If you’re feeling splashy, pour a great French Champagne, such as Taittinger La Francaise (around $35/bottle). If you’re not up for the splurge, go for a Champagne Look-Alike (an inexpensive bubbly from somewhere in France besides Champagne. See my article about the options on BonjourParis.com). • Main Course through Cheese Course: Beaujolais Cru! (NOT Beaujolais Nouveau, mind you). Read all about these great wines! (Yes, a Pinot Noir from Burgundy is classic for this dish, so you can’t go wrong there, either). • Dessert: If your guests are still up for a sip, bring out a fruity sparkler (Extra Dry or Demi Sec).